In the midst of folding laundry, coordinating carpool schedules, and breaking up fights, many parents get lost. Feeling pressure to do everything "right" and raise up "good" children, it's easy to lose sight of our ultimate purpose as parents in the quest for practical tips and guaranteed formulas. 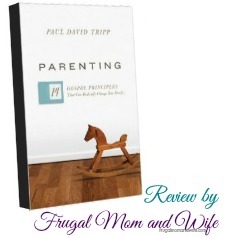 In this life-giving book, Paul Tripp offers parents much more than a to-do list. Instead, he presents us with a big-picture view of God's plan for us as parents. Outlining fourteen foundational principles centered on the gospel, he shows that we need more than the latest parenting strategy or list of techniques. Rather, we need the rescuing grace of God—grace that has the power to shape how we view everything we do as parents. Freed from the burden of trying to manufacture life-change in our children's hearts, we can embrace a grand perspective of parenting overflowing with vision, purpose, and joy. We glory in the cross! By grace we are saved through faith not of works, we boast in the Lord alone. We trust in the finished work of Christ on the cross, our sins are paid for and we are saved and sealed. Knowing that Christ is our foundation and growing in the knowledge of God is a process, where you start can make or break you. The Gospel of the Grace of God according to the mystery revealed to Paul our special apostle is where you begin. Knowing that is is God who works in us, we guide our children in the knowledge of the truth so they can be equip ambassadors of Christ redeeming the time, teaching others, seeing souls saved and saints edified!! To God the only wise be glory through Jesus Christ our Lord!